Smiling at the Baby in the Mirror, originally uploaded by fuzzypeach. Pearl loves the mirror on that toybar so much! 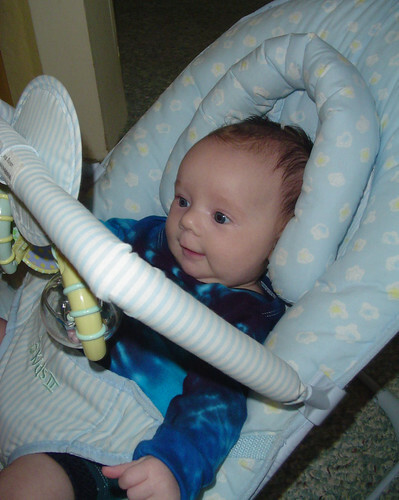 She smiles and coos at her image, and hits the toys to either side of it. I don't think she's hitting them on purpose yet but either way it's pretty cute and she enjoys it. p.s. I washed her hair this morning and am pleased to announce that the cradle cap has retreated for now and her scalp and hair are both looking lovely. Hooray. HI! I love love that picture. My girl is now 9 months old (oh, and still battling craddle crap, sadly) and sometimes I forget the tiny stage. awwwww, so precious! I can't wait for the smiles!